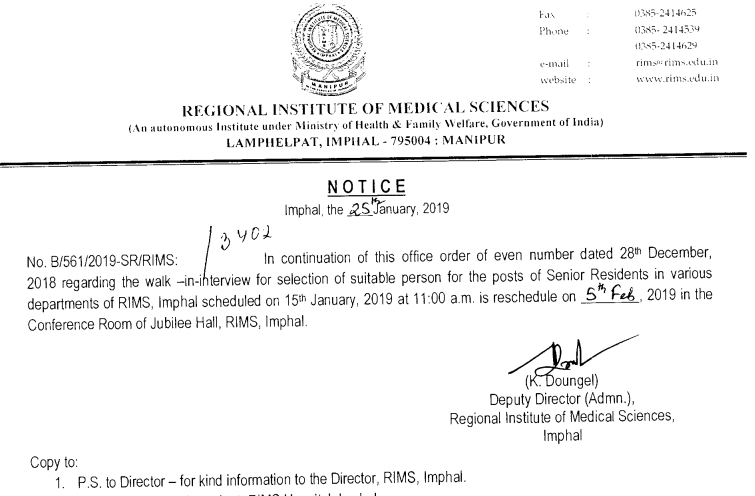 The Regional Institute of Medical Sciences, RIMS Imphal has informed to all the concerned that the walk-in-interview for the recruitment of the post of Senior Resident in various departments of RIMS, Imphal scheduled on 15th Jan 2019 at 11 am is rescheduled on 5th Feb 2019 in the Conference room of Jubilee Hall, RIMS Imphal. Candidates age must be maximum 45 years. Relaxable 3 years for OBC and 5 years for SC&ST candidate and also age relaxation for physically handicapped candidates will be provided as per Govt, of India norms. i. Postgraduate degree (MD/ MS/ DNB) in the respective subject from the institute recognized by MCI. ii. Candidate must be registered with the Manipur Medical Council/ Medical Council of India. Rs. PB 3 Levei-10 is being revised to PB 3 Level-11 with approval of the Ministry of Health & Family Welfare.